In four short years, Teachable has grown to over $1 million of monthly revenue and last year, they helped their creators sell close to $190 million in courses. One of the most unique aspects of Teachable’s story is that their CEO, Ankur Nagpal, scaled his business by following the counter-intuitive philosophy of “doing things that don’t scale.” During this interview, you’ll find out how Ankur hacked growth at Teachable using UDemy’s API (until he got shut down), how he identifies the best business opportunities, and how he’s approaching building a growth team from scratch. Find out why these strategies work for Teachable and how you can apply these lessons to your own marketing teams. 5:35 — Ankur Nagpal on transparency as a secret business hack. Do you worry about being too transparent? Why do you build transparency into your business? 15:58 — Building a growth marketing team at Teachable. How have you built it? Grown it? Thought about it? 20:29 — What are the counter-intuitive lessons you’ve learned about growing a SaaS company? DR: What’s up growth nation? Dave here, and welcome back to Scale or Die, the show where we uncover proven strategies from CEOs and growth experts behind some of the world’s fastest growing startups. In this episode, we have a lot to go over. We’ve got Ankur Nagpal here with us, the CEO and founder of Teachable. DR: For those of you guys who don’t know, Teachable is a fast-growing platform that allows entrepreneurs to create and sell their own online course. In four short years, Teachable has grown to over $1 million of monthly revenue and they will help their creators sell close to $190 million in courses this year. DR: Ankur, thanks for coming on man. AN: It’s a pleasure to be here man. DR: This is exciting so we were laughing about something in the office today. I was looking at your Twitter and the pinned tweet that you have at the top, it’s hilarious. AN: Is this my family? AN: We only grew 3 and a half percent that month and dad was not impressed. DR: That’s your dad responding? AN: Yeah that’s my dad. AN: My parents still have a shared email account. They both have the same email so that was definitely my dad. AN: Even this morning my dad called me and he’s like, “What do you think, is growth gonna be 3% this month, “2 and a half, where do you think we’re gonna land?” It’s like dad, this is not your company. DR: So has that been like your life all growing up? AN: Sort of but it’s funny honestly. My parents are highly, highly supportive. Just looking at this out of context. It seems like they have certain expectations but no, they’re super chill. This was just because I talked to them about work and stuff and it presents them that way. DR: Yeah yeah, very cool. We thought that was really funny. AN: The worst part is, so we also have a Facebook group, right. It’s 25,000 members and it’s both awesome because we connect with our customers and sometimes it turns into everyone like pouring love at us but occasionally when we get stuff wrong it’s also where all our customers kind of gang up on us and the worst thing is, so say something bad has happened and we’re already in the midst of a PR crisis, I start getting my Facebook messages from my dad quoting posts in the group, ’cause he’s in the group too. AN: He’s like, “What are you guys with VAT taxes?” I’m like dad, this is not your domain. DR: Ah that’s amazing, well it’s fun to have family ties with startup. AN: Yep, yep, yep, yep. DR: And sometimes a little bit weird. AN: A little bit too much sometimes. DR: Yeah well tell us about Teachable. I mean how did you guys start? What’s your model? How do you make money? AN: Yeah absolutely so Teachable is now a little bit over four years which is insane ’cause we were never intentional about hey, we’re gonna create a company. Teachable started off as a side project. A friend of mine and I, Conrad, we had a few online courses on Udemy, we were teaching at General Assembly and teaching at Udemy we, you know, we were able to get to 2, $3,000 a month in monthly revenue but there was no way of scaling beyond that since we never quite, you never controlled your own audience, you couldn’t buy paid ads, you just couldn’t. It wasn’t a platform you could grow and scale with so we built the first version of Teachable entirely as a side project, validated it with Conrad as the first customer and then slowly started going to other Udemy customers and one-by-one getting them on the platform and it was probably six months in that I was, okay, this is a real company. DR: Was the plan to actually build this newer product or was it just let’s build something so we can sell more courses? AN: It was in a way that I’ve had like 25 other side projects and you always hope something kind of works and this one did so there was always a thought but it took six full months to be like this is a real company, let me go and raise money for it and actually build this out. So six months later we built, six months later we raised a bunch of money, hired an actual engineer who looked at all the bad code I wrote and rebuilt it from scratch and then off to the races. AN: The business model initially was, the product has always been mostly the same or the idea of being the products always mostly the same, how can we help creators sell online courses as easily and as effectively with their own brand, their own domain, their own website so that’s been almost the same. Our business model changed a little from transaction fee only to more of a SaaS model with a little bit of transaction fees. So early on we charged 15% of every sale but found it really hard to scale that model since revenue was not predictable but I mean it’s been four years since we moved to SaaS and kind of been primarily SaaS with about 20 to 25% of revenue coming in through payment processing. Are you trying to grow that payment processing now or is it more of the SaaS? AN: Primarily payment processing because frankly, it’s easier to grow at this point just because this month we will probably have $16 million worth of course sales going through us. Of the $16 million of course sales about eight to nine million does not touch us at all, like it goes straight to the buyer to the seller account but by rebuilding payment processing we can basically momentarily hold on to the money for, talking like seconds here, almost 3% is revenue. We have 80 basis points of margin and then we can also do cool things for our customers like pay their taxes for them, pay out their authors and affiliates and stuff but basically of that eight million there’s probably a quarter of a million of free revenue just by kind of redoing how we do payment processing. DR: Very cool, I love that. DR: So you publish a lot of stuff online on Medium— if you go search what you’re doing, you’re pretty transparent with what you’re up to. Tell us about that. Why do you do that? Do you worry about competitors? For me, are there competitors that, like do all our competitors know our numbers? Yes, is that deeply gonna change anything? No and as a trade-off I think you build trust with people. Like I think it’s just so much easier to build trust with someone when you’re completely up front, completely truthful and even internally as a company we talk about transparency as one of our cultural values so it’s cool to be able to do that. Now the real test will be let’s imagine we have a completely terrible year, being transparent then I’m sure is going to be even harder but I think that’s the ultimate test, right? DR: Very cool. Okay so going back to the beginning, I was just curious, like talking about growth. How did you jumpstart growth at the beginning? Was it direct outreach? Was it ads? AN: So a few things and yeah, one we started by doing direct outreach to anyone that had a course on other platforms. It was disgusting, it was basically my personal Gmail copying and pasting the same email to hundreds of people. It was not a scalable process at all. It was the epitome of do things that don’t scale but very early on we discovered, okay, the Udemy audience to be a pretty good one and it coincided with Udemy changing their pricing policy to, earlier they would give instructors 70% and they changed it to 50/50. So it created this uproar of people really mad which was kind of the perfect storm because we had just started, we had a product, people were talking about us then Udemy just went off and went and pissed off all their instructors so that helped a lot and then we did something that I found kind of cool, we eventually had to take it down but we built a tool where you could log in with your Udemy credentials and we could pull all your Udemy content in a matter of minutes. So all of a sudden activation and onboarding became really, really fast because instead of uploading all these courses, you could log in with your Udemy credentials and pull in all your data and you could have like six courses ready to go right there, one button and launch. So that helped a lot in the early days. AN: We just used their API. DR: You just did it. AN: Yeah we just used their API. AN: So it was cool. DR: Okay cool, so you started off mostly kind of direct outreach, non-scalable Gmail. How did that change as you started to grow and were like, we can’t do this forever? AN: As we started to grow we had to figure out a funnel. Most of our funnel came down to, it still frankly is, we have a free version and through the years we’ve continually gotten better and better converting free users to paying users. The sad part is our biggest channel now is still the same as what our base channel was two years ago which is primarily different kinds of workshops to convert free users to paid users and that’s been something has, we’ve used the same playbook over and over. On top of that, we used events a good amount. Like for instance, the end of October, we’re gonna run an online summit where we’re gonna, if we execute to our plans, we’re gonna have maybe 60 plus thousand people sign up for the summit with a goal of converting anywhere from 1,500 to 2,000 new paying customers which could be anywhere from 60 to 100K in new MRR. So events like that, while they take a lot of work and aren’t fully scalable have also been a strategy we leverage because what we find is in our space, it’s still fairly influencer driven, like other people want to do what Pat Flynn is doing so leveraging the combination of workshops with influencers has worked really, really well. DR: Do you do a lot of affiliate stuff with those kinds of people? AN: We do but it’s probably still not enough. It’s still something that I think is easy pickings for a while longer and we just haven’t for internal reasons, gotten our stuff together enough to do as much of that. DR: Yeah and I’ve seen you and your team at several different conferences. Has that been kind of a growing channel for you guys? AN: Conferences help but like look, our basic economics for a customer, we make $70 a customer a month so conferences work but with conferences, what, you’re gonna get 10 customers, 15 customers? You’re not gonna get, with everything work how do we get 500 customers? So conferences help, they’re absolutely ROI positive but I wouldn’t say they’re a primary driver of business growth. DR: So why do you guys go? Why do you think it’s worth it? 1) It’s still net positive in a way that we get to meet our community which is really, really cool. 2) We get to meet a lot of other influencers and promoters in the space. 3) It’s also helpful, like we met at a conference, it’s also helpful to see what other people are up to, fostering relationships and just like almost makes them more human, like makes the connection a lot more human than looking at your creators as someone you just interact with online. So we still do a bunch of conferences. DR: Yep, very cool, love it. Okay well, now we’ve got our first recurring segment of the show. DR: This is my favorite. This is a game show inside of an interview. I don’t know if anybody else is doing it. And this is called “Which Test Won?” So basically how it works is you’re gonna be able to win some money here. I’m going to show you three different A/B tests. You’re gonna take a look and decide which one you think actually outperformed the other. AN: Cool, how much money are we gonna win? DR: Well it’s not a lot but it’s something here. So for the first two, if you get ’em right, you’re gonna win 20 bucks each one and the third one is gonna be worth double so it’s gonna be worth 40 bucks so 80 bucks total and we’re gonna donate that to a charity of your choice so you chose Charity Water and we will make that in your name depending on how you do. So are you ready? DR: Do you get to look at many A/B tests in the weeds on the growth marketing team? AN: I don’t do many A/B tests because my instincts are so good so this will be fine. 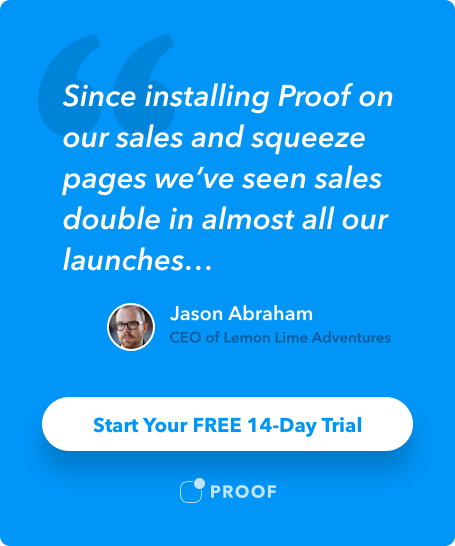 DR: Using Proof on your site can start increasing leads and sales by 10% in less than 10 minutes. The one on the right is a headline without conversions, without numbers or with, we use the word conversions but we don’t use numbers and we say instantly boost your website conversions with social proof. Which one of these do you think converted better? AN: That one, the one on the right. DR: The one on the right and why do you think that? AN: I think it’s also the placement to fit, like it’s centered, it draws your eye to enter your email address. It, yeah. AN: Okay, let’s go, let’s go. DR: This one, I’m with you though. When I look at the cleanness of the one on the right. When I look at the one on the left, I think it’s more friendly. AN: 22% is very significant. AN: I love people trying to rationalize why an A/B test won because you have no idea if you’re right or wrong. DR: Totally and on this one, we changed so many different variables, it wasn’t like one little thing. DR: Actually that one’s red and it’s different than the blue call to action, we had mixed call to action colors which I think you’re not supposed to do in the biz but it worked for us so far. Yeah so for us when we were trying to figure out how to increase conversions of the one on the right, test B and I think like a start-up like, it’s easy to test little tiny things in order to isolate the variable but on the left we were like let’s just scrap it, let’s start from scratch, like let’s just come at this thing and just try to do a whole different looking site and that ended up working because we were going for a big lift and sometimes you have to sacrifice knowing exactly what happened. There just wasn’t a whole enough traffic to test every little detail. AN: Yep makes sense man. We don’t A/B test a lot just because very often the things we work on are so fundamental that A/B testing is almost a luxury. We don’t have time for. We need to increase things like two or three X which is not gonna happen with A/B testing. DR: Yeah so true, exactly. Alright, number two is, basically what we have here on the right-hand side test letter B is our long home page. This is kinda our standard home page then test A, we said well what if we shorten this thing up? What if we made a really short one, put everything above the fold to try to get people to start, less distraction. Actually, I saw Nathan Barry of ConvertKit had a home page like this, well let’s go try it. Which one do you think won? AN: Short home page but who knows? I have no faith in my instincts anymore. DR: Well… why do you say that? AN: Because what’s the ask, right? I think when you’re trying to sell long makes sense because it’s a big ask. You’re trying to get someone to give you money. Here you’re trying to get someone to enter their email. DR: Alright well we’ll see which one won. The answer is B.
DR: It had a 42% decrease in new account sign-ups. AN: So what do you count as a new account sign up here? AN: Not just email, okay. DR: And going all the way through. I think there was a slight decrease in actually entering their email on this first page as well. AN: I’m sorry Charity Water. DR: We spent a lot of time on this page here and it actually decreased which was frustrating but at least we tested it and shifted everything over to it. And then the last one is worth 40 bucks so there’s still hope for Charity Water. AN: There’s still hope, there’s still hope. DR: So this one is one that we found online, an example and the goal was to increase click-throughs to the next step so test A is basically a sales page and they just go straight for the content. Test B was the content was pushed down and they had a big list of testimonials at the top to kind of warm you up I guess and show you other people that have done this so really social proof was added to the one on the right, test B. Which one do you think won? DR: First one? Content first, no testimonials? AN: The goal was just to get people to move to the next step? DR: Click through to the next step. AN: Yeah I think the way the testimonials are, people could just bail because it’s harder to get to the next step. DR: Okay, alright, well we will see. How do you feel? AN: Not confident at all anymore. DR: Alright the answer is adding the testimonials actually increased it. AN: Zero out of three. DR: Zero for three but these were tough ones, these were the toughest ones we’ve actually run. Test B actually has benefit-focused testimonials where each pain point is kinda attacked by different testimonials that overcome the obstacles and so I guess adding that added a 17% increase in button clicks which is pretty sweet. AN: Sweet, quality and service, colors never fade. DR: So I’m curious, sorry for Charity Water. AN: It’s all good, that’s fine, no worries. DR: You still have to donate your own money. AN: Yeah I’ll donate it, it’s okay. DR: So what does the growth scene look like? How have you built that out? How have you grown that and how do you guys think of growth at Teachable? AN: Yeah so my team has continually evolved and right now we’re almost in a state of flux where we’re rebuilding a little bit because a lot of the things we used to do kind of stopped working just because for a long time we do a lot of events, do a lot of things that added new revenue in kind of discrete chunks while churn affected as a percentage right so we got a point where we yes, we can do an event that will add 30 to 40, 50K in MRR but the more MRR grows, unless we get our churn down we churn a bigger percentage so you keep needing to add more and more revenue to hit the same growth rate so my team is in a state of flux right now. Right now we have it set up as two separate teams, an acquisition team, and an engagement team but we’ll probably eventually move to three teams, an acquisition team, a product marketing team and then an engagement team. Right now product marketing is a bit of a hole where we have someone on product doing a little bit, we have our content team doing a little bit but it kinda fits in nowhere. What do you mean when you say product marketing? What are you hoping that they would do? AN: So I’ll give you an example right. Payments, we’re about to launch a new payments product. There’s no-one deeply suited for driving adoption of that payments product within our customers. We have 20,000 customers. If we have 2,000 versus 5,000 people adopt payments, that’s a huge difference in the success of how good this deal goes. And right now that kind of doesn’t belong anywhere. Yes, our email team will do a campaign for it but there’s no-one really owning product marketing, certain feature adoption as a category. And the bigger you get, like the more customers you have, the more you have to use them as lever versus just new customers so that’s a bit of a hole in our marketing strategy right now that we’re looking to rectify. DR: Gotcha and you just hired someone to take care of paid acquisition. That’s been something that’s been kinda frustrating for you, hasn’t it? AN: It is, it is. DR: You haven’t been able to work. AN: We’re sitting on, we have over 11 and a half million dollars of cash that we want to use to grow faster and we’re not able to successfully deploy paid at a scale that actually works for us. DR: So what’s that been like, the process? Has that been like a ton of experiments and they’ve failed or do you not have people to run it, or? AN: It’s been two phases. For a while it was a bunch of experiments that never quite worked and I think our funnels need a little bit of work to fully get there and then for a while we just had no-one to do it so it became the thing that we kind of slipped for a while but yeah, now we just hired someone and we’re super, super excited to see if we can actually learn how to spend money to grow faster. And we could always do paid and can still do paid for the easy stuff like retargeting to amplify existing campaigns but straight up prospecting is pretty hard. DR: Yeah, yep and do you guys do any SEO work? Like you might call it content marketing. AN: Yeah we do, we do. It’s a reasonably good channel. Again it’s not like, like of the leads we get right now it’s still about 70-ish percent come from people signing up for a free plan which so, yes content and stuff, all that contributes only about 20 to 30%. DR: Interesting and so where do most of the people come from? Obviously, you get a ton of sign-ups. AN: So the cool thing is right, we help people basically build a website and they, in turn, have lots of people coming to that website. Lots of those people see Powered by Teachable and word spreads that way. When we survey our audience we find out more than half of them have come from a referral. Not a trackable referral but just heard about it from a friend which is good because that lets you get away with a lot of stuff if there are people, if people like you enough to talk about you because frankly, I think we’ve mis-executed enough that had we not had the leeway of just inherently having people talk about us, we would not be where we are today. DR: Yeah I’ve looked up reviews of you guys and seen you guys sell, it seems like the customers love it. Super intuitive, super happy and so I think that’s probably what drives most of it, isn’t it? On the other hand, we also help people earn a living so it’s very close to them which is something I always remind the team as well. It’s a pretty big responsibility, I mean, people are entrusting us with their livelihood for a lot of them so that just makes the connection that much closer. DR: Very cool so you’ve learned a lot. What’s something that you have learned and believe about scaling a SaaS company that’s maybe counter-intuitive or different than what a lot of people are talking about out there? AN: Yeah I mean there’s just, so depends on what world you’re coming from but the biggest mistake I see from, I don’t think you guys are guilty of it but I almost think like you and I might be the exception here, but especially in Silicon Valley, the whole pervasive myth of just build a beautiful product and growth will come. They focus so hard on the customer journey, so hard on the product that, part of the reason we grew is just because we were very intentional about it. We were never like, oh hey, we’re gonna grow, let’s just grow at whatever rate we can. We work backward. We’ll be like okay, we wanna grow 12% this month and we think we’re gonna churn 6% so 6% of churn is 30K so that means we need to add 84K in new revenue. Okay, let’s break it down. Out of 84K, we think we’re gonna get 16K for, like we’ll try and account for every single dollar of growth before the month begins and most of the time we miss it but when we miss it, we know why. We can go okay, fine, these webinars underperformed. We thought this would happen here, that happened there. But we’re very, very intentional. We try and account for every single dollar of growth before the month in which it’s supposed to get. DR: Alright man, well we are in the fourth quarter. We are coming to a close here. I wanted to give you what I call the salty six. DR: The salty six is six fairly rapid-fire questions we wanna ask you just to get to know you better, learn about what you’re learning about and have a little fun so you ready? DR: These can be intimidating. AN: Yep, let’s do this man. DR: But I hope they won’t be. AN: That’s why we have editing. Alright, number one, what do you do for fun? DR: What do you play? DR: Do you have a similar swing? AN: Very different, so my softball swing is actually very effective because it’s super, super, ugly. It’s like a cricket swing but no-one places catchers there. Like it’s just like this bizarre, like I don’t charge down but it’s very effective. DR: Alright, so play sports, softball, very cool. AN: Probably MicroConf, I went this year, it was pretty good but I will caveat it with I am not specifically a conference person, it’s not my learning style. AN: Is it bad that I don’t listen to any? DR: That’s fine, that’s an answer. AN: I’m reading fiction right now. I’m reading Kurt Vonnegut’s book Time Quake. I used to read a lot of business books, lately, I’ve been reading a lot of fiction just because I look at it almost as an alternative to TV. It’s a time to switch my mind off. DR: And you read that at like night before bed? AN: ‘Cause I mean, more contemporary right? Like Jordan you read about, that’s before my time. And what one person would you like to invite to a dinner party, dead or alive? Who would be super interesting for you? AN: Because I totally would fan-boy over the Weeknd. I just wanna be friends with him, that’s all I want. DR: That’s amazing, I love that. Well alright folks, there you have it. Ankur thanks so much for coming man, it’s been great. If people wanna look you up and find out what you’re doing, where can they find you? DR: Go sign up. Check out the webinar, get activated. DR: Alright, well there you have it. The Weeknd, if you’re listening, go to teachable.com, make a new friend.